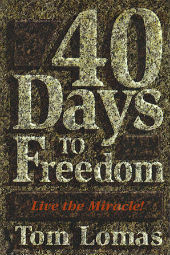 40 Days to Freedom: Live the Miracle! Tom Lomas, a family man and a professional, was possessed by a powerful addiction. It was defined by psychiatry as a classical neurosis and a masterful instinct. In desperation and faith he prayed to be cured. The prayer was answered in the form of an extraordinary miracle. He was instructed to write this book about the miracle so it could be experienced by others with similar afflictions and want to gain control of their own minds and actions.